So this is an unusual title for a blog post, don’t you think? If you know anything about Warren G. Harding (don’t be embarrassed if you don’t; he was eminently forgettable), you’ve got to be shaking your head and wondering. What in the world does Warren G. Harding have to do with the leading lights of the revolutionary generation? The group that we normally refer to as “the Founding Fathers”—Washington, Adams, Jefferson, Franklin, Hamilton, and Madison, to name the most prominent—were individuals of remarkable character, courage, intellect, and vision. No one, not even his closest friends, ever accused Warren Harding of any of these traits. In the public realm, Harding’s administration became synonymous with scandal and corruption. His attorney general (a close friend and political adviser whom he rewarded with a cabinet post) was twice indicted for fraud. The director of the Veteran’s Bureau (forerunner of today’s Veteran’s Administration) went to jail for diverting medicines from hospitals to narcotics dealers. The Secretary of the Interior served time for accepting bribes from oil companies in a scheme now remembered as the Teapot Dome scandal. Behind the scenes, Harding’s private life was decadent, if not depraved. As president he drank heavily. (And illegally I might add. It was the middle of Prohibition, after all.) He also held twice-weekly poker games in the White House, and he liked to keep “late hours,” a 1920s euphemism for enjoying the company of women other than his long-suffering wife. Harding engaged in at least two prolonged adulterous affairs during his political career. The first, with the wife of a good friend, culminated around the time of his election to the presidency, a termination facilitated by hush money paid from the coffers of the Republican National Committee. The second, involving a bright-eyed blonde thirty years his junior, continued until his death of a heart attack in 1923, and included liaisons in the Oval Office. Not surprisingly, this one-two combination of public and private dishonesty has won for Harding a consistently poor reputation among historians. In 2009, for example, C-Span surveyed sixty-five prominent presidential historians and asked them to rank the forty-two men who had served as chief executive between 1789 and 2008. The survey asked respondents to give each president individual scores for ten separate leadership categories, including public persuasion, administrative skills, international relations, and “moral authority.” Harding ranked thirty-eighth overall and thirty-ninth in moral authority. The only presidents deemed less effective as moral leaders were Andrew Johnson, who was impeached; Richard Nixon, who resigned to avoid being impeached; and James Buchanan, who did little more than wring his hands while the nation careened toward civil war. This is not auspicious company. Standing in this presence, mindful of the solemnity of this occasion, feeling the emotions which no one may know until he senses the great weight of responsibility for himself, I must utter my belief in the divine inspiration of the founding fathers. Surely there must have been God’s intent in the making of this new-world Republic. As is so often the case, the new phrase passed quickly into common use, and pretty soon no one could remember where the term came from. Not recalling a time when the term wasn’t popular, most folks probably assumed that it was a lot older than it really was. So how is this piece of historical trivia significant—if it’s significant at all? Does it somehow reflect on the Founding Fathers that they owe their honorific title to a hard-drinking philanderer who exploited them in a partisan speech nearly a century after they had passed from the scene? But if this story shouldn’t affect what we think about the Founding Fathers, it should inform how we think about them. To begin with, it reminds us that what we call “history” is not the past itself but rather the remembered past. History is a form of memory that exists not in the past but in the present. Historical memory, like memory generally, is always influenced to some degree by our current vantage point. In the self-satisfied 1920s, praise of the Founders was simply good politics, but it has not always been that way. While the Founders were still living, Americans regularly denounced one or more of them (while the Founders themselves were regularly denouncing each other). Republican newspapers condemned Washington as “the scourge and misfortune” of the country while they mocked and ridiculed “the blind, bald, toothless Adams.” Federalists fired back in kind, condemning Jefferson for his infidelity, hypocrisy, and radicalism. They repeatedly predicted (and perhaps hoped for?) the “just vengeance of heaven” should he be elected president. By the 1820s the Founders’ stock had begun to rise, however. The country was approaching its fiftieth birthday, and the generation that had led the way to independence was passing from the scene. Like a youngster now old enough to have memories, Americans became more interested in their collective past. (They were also more willing to ascribe sainthood to the dead than to the living.) More or less continuously since then, Americans have imputed great significance to the Founders, although they have defined the Founders’ legacy in numerous and often contradictory ways. This leads to a second insight imbedded in the story of President Harding’s christening of the “Founding Fathers.” Harding’s veneration of the Framers may have been sincere—it’s hard to know—but what is certain is that he was remembering them in a particular context and for a particular purpose. In this particular instance, Harding wanted his audience to understand that the “divinely inspired” Founding Fathers would have been opposed to American entry into the League of Nations, which was coincidentally the position that he held as well. I don’t entirely agree with Wedgwood. I think a lot of people view history purely as a form of entertainment. (That’s certainly how the so-called “History Channel” portrays it.) But I agree with her in this respect: among the minority who believe that history is truly important (or pretend to believe so at any rate), it’s the rare bird who thinks of history as truly important for its own sake. Academic historians will debate the past endlessly for all kinds of esoteric reasons, but when normal people debate the past, more often than not it is because they believe something important is at stake in the present. This is why popular historical debates are almost always debates about contemporary policy in disguise. This is all the more true when the disputed question is something like the vision or values of the Founding Fathers. Few questions about our nation’s past are more morally charged. A minority of Americans are willing simply to dismiss the Founders as a bunch of irrelevant dead elitists, but most of us would rather have them on our side when we do battle in the public square. As a historian, I would say that there is both good news and bad in this mindset. The good news is that it spurs us to pay more attention to history than we might otherwise. The bad news is that it predisposes us to discover in the past whatever our present agendas make it convenient to see. POSTSCRIPT: The surprising history of the phrase “Founding Fathers” comes from The Founding Fathers Reconsidered, by R. B. Bernstein (Oxford University Press, 2009). Bernstein, a Professor of Law at New York Law School, has written a brief and accessible introduction to the Founding Fathers—“who they were, what they did and failed to do, and why we care.” It’s far from the last word on these questions, but not a bad place to start if these are questions that interest you. This entry was posted in Faith and the American Founding, Recommended Reading, Thinking Historically and tagged faith and history, founding fathers, R.B. Bernstein, Teapot Dome Scandal, Warren G. Harding. Bookmark the permalink. As a new follower of this blog, I am enjoying reading Faith and History and sharing surprise history truths I glean from the postings. Today’s information gives me HOPE – History Opens Providence’s Existence. 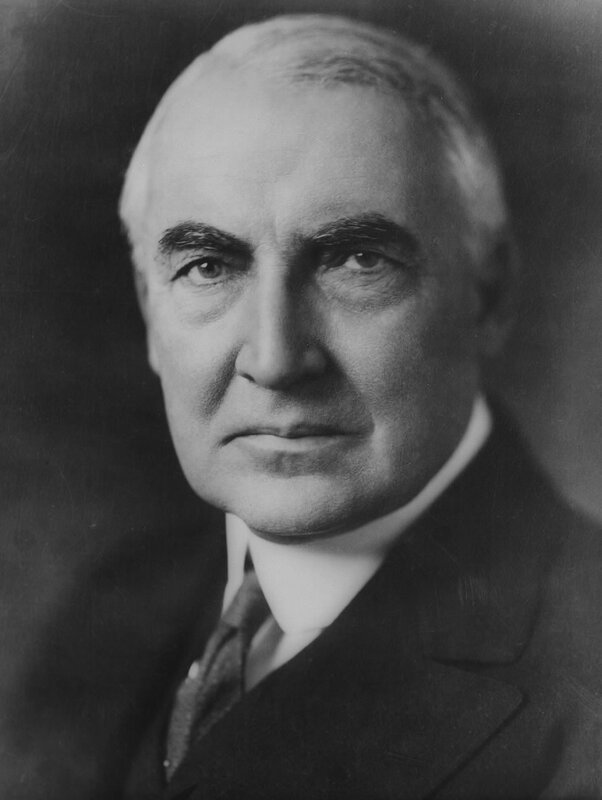 America obviously survived President Harding as 91 years later I can read, write and speak whatever I believe. I hope America survives all future Presidents until the King of kings returns.